CLICK FOR NATIONAL PHOTOS GREAT NEWS FOR GSD OWNERS!! 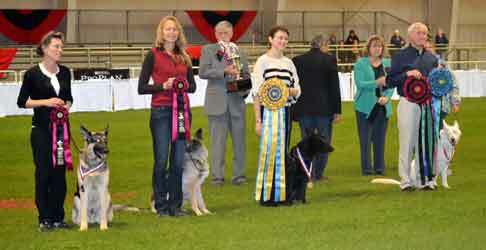 The German Shepherd Dog Club of America is discounting its membership fees to new members! For $36.00 ($30 off the regular membership fee) you can join the GSDCA, receive the Review and, BEST OF ALL, have a VOTE in the future of the white German Shepherd Dog. 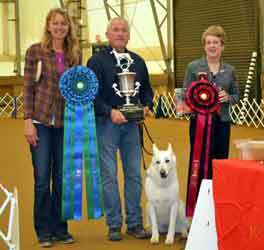 Membership in the WGSDCII helps us protect and promote the white-coated German Shepherd Dog. 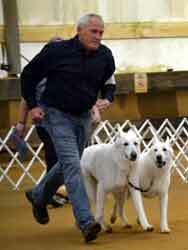 You will also receive our newsletter and information about events for white GSDs. 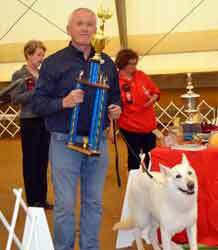 Ron receiving the Grand Victrix Award at the GSDCA National October 11, 2013 with his dog Zephyr's Adelaide Princess "Addie"
Ron doing Brace with Addie and Reilly at the 2013 GSDCA National. He took first place! 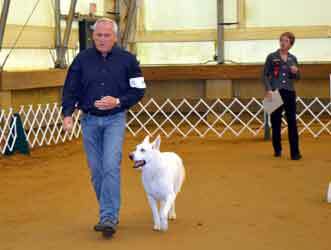 at the 2013 GSDCA National with his GSD Addie. An awesome feat and history in the making! PLEASE consider joining the German Shepherd Dog Club of America (GSDCA). They are the parent club for all German Shepherd Dogs regardless of color. We will help you. Financial aid for those who qualify. 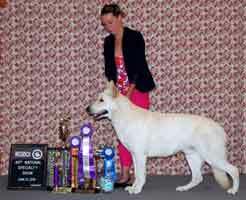 Welcome to the official home page of the White German Shepherd Dog Club International, Inc.™ (WGSDCII). 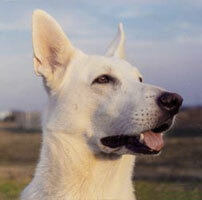 The purpose of the WGSDCII is to protect and preserve the name and heritage of the white-coated German Shepherd Dog. The Club is dedicated to promoting the interests of this beautiful dog by educating the public and hopefully, some day, turning the tide of prejudice against the white-coated German Shepherd Dog. 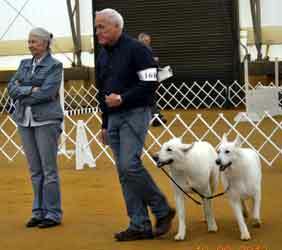 The WGSDCII™ is the largest and oldest organization serving owners, breeders and fanciers of the white German shepherd. 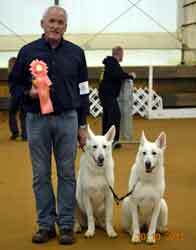 The Club encourages and promotes quality breeding of the white German Shepherd by collecting and distributing information pertinent to all white GSD owners through our publications and special programs. We invite you to enter this site using the links and drop-down menus above and learn more about white-coated German Shepherd Dog and the WGSDCII™.